Clifford and I struck an accord this December. He wants to grow a beard. I like clean-cut. Maybe clean-cut with a bit of scruff, but he wants a full-on-lumberjack-not-quite-ZZ-Top-looking beard. Anyway, I know beards are trending right now, particularly thanks to hipster types that are into those special beard oils and overpriced maintenance kits. Heck, Wil Wheaton shared a blog post about the year of the beard just yesterday. It’s a thing. I get it. Still not my thing. But he was set on growing a beard. It was his dream. A dream I had prevented from happening for over nine years. We had finally hit our impasse. Well, when at an impasse, no time like the present to negotiate. And negotiate terms I did. Six months. He would have until June 15th, 2015 to grow his beard. At that time we would reassess his poor decision. See, the way I see it is that if I have to stare at that hideous monstrosity day in and day out hiding the face with which I fell in love, it’s only fair that something just as lovely is substituted in return to refocus my attentions elsewhere. A six pack is a worthy substitution. So on June 15th, if he likes the beard, AND he has a six pack, the beard stays. Otherwise, that thing is coming off faster than a prom dress with much less sentimental attachment in its wake. I felt my husband needed some inspiration for his journey. Gaining a six pack is no easy feat. He’s no longer what you might call a spring chicken, but he’s still only 34. Six months of hard work is doable. I needed to show him some other guys in their 30s who took it and ran with it so he could understand the possibilities. I wanted him to see exactly how I wanted him to look what he could look like with some hard work and dedication. Enter Chris Pratt (well, and Stephen Amell). Just as women everywhere have their little boards of inspiration, I thought Clifford could use one, too. After all, sometimes telling someone isn’t the same as showing them what you mean. So I sent him these. A beard like this would be great. A beard like this would be absolutely acceptable. Abs like this is what I mean. Clifford could SO make this happen. He pretty much laughed in my face, “whatever’d” me, and kept on growing his beard. It’s been about a month since we made our deal, so I thought it was time for a quick check-in the other day. Maybe a few motivational words to keep Clifford going. I sent him this. 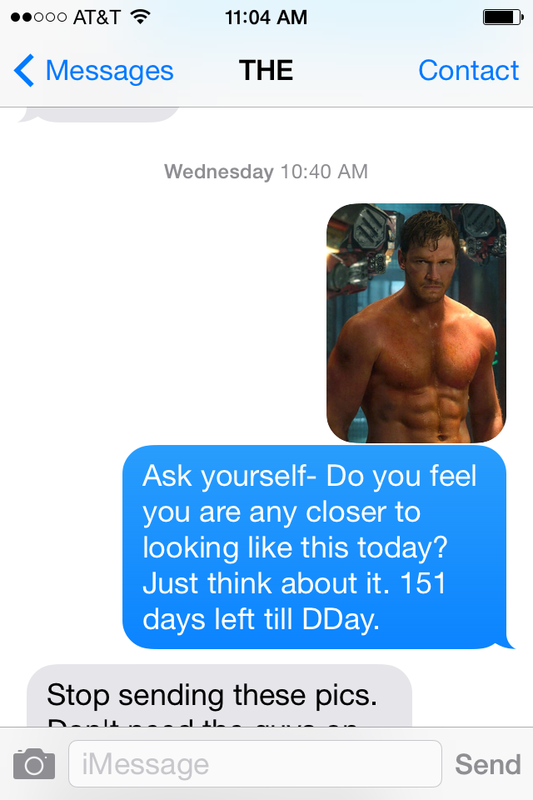 What better motivation than Chris Pratt’s abs? Then I received an immediate cease and desist request. I believe the words he texted were: Stop sending me these pics. Don’t need the guys on the job seeing me open pics of half-naked dudes. So stop. The text was followed by a phone call. 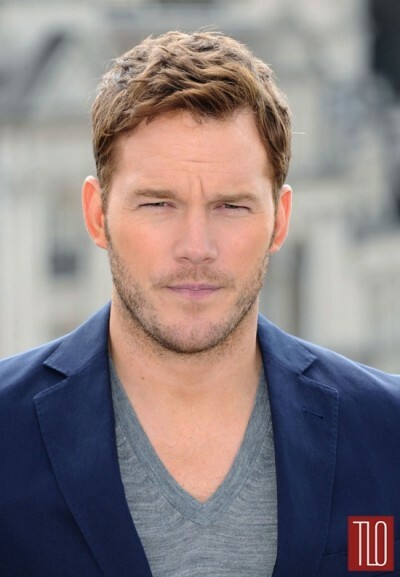 Clifford said he was with his contractor and his client showing them pictures of samples on his phone when all of a sudden Chris Pratt showed up in all his glory. And he didn’t show up on the phone like he does in the aforementioned text message. He showed up like this. Clifford said the contractor and client both looked at him, then at each other, then to Chris Pratt’s abs, then they looked anywhere but at Clifford and Chris Pratt’s abs. No one said a word and Clifford went back to showing samples. Needless to say, he was not as pleased with Chris Pratt’s motivational abs as I’d hoped he’d be (never thought I’d write a sentence like that… hmmm). Regardless, it’s on. The Great Beard/Ab Compromise of 2015. 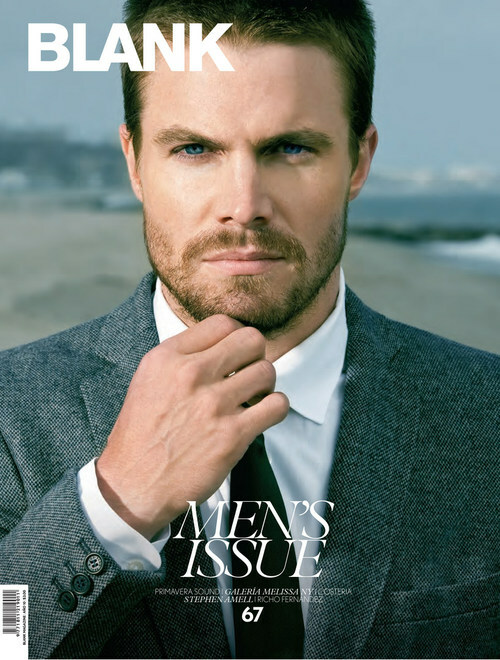 A thank you in advance to Chris Pratt and Stephen Amell for unknowingly offering your bodies yourselves as stimulus on Clifford’s quest to meeting my conditions. It all comes down to June 15th, folks. Stay tuned.